Here it is! 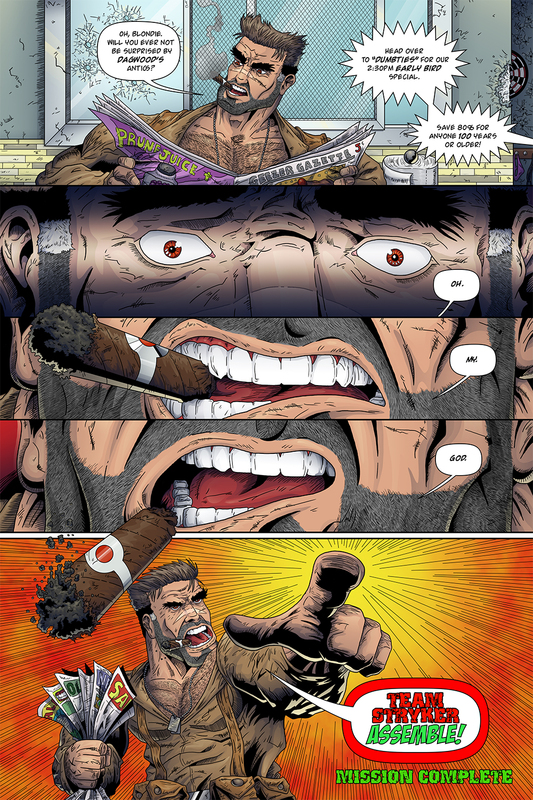 The last page of Team Stryker Mission 009. This issue has taken me over a year to complete and it feels like a weight has been lifted off of me now that it’s complete. The physical books have also arrived and it looks even better in person. Having this issue completed reminds me what a rough year 2016 was and the long road to better things in 2017. Since the start of this issue I’ve moved three times and had a major career change. I’m happy to say that all the changes in my life leading up to this point have been for the better. I’m in a position to make 2017 and onward the best years of my young career. For anyone interested in purchasing physical copies of Mission 009, I’ll be at the Edmonton Comic Expo this Friday – Sunday in Artist Alley. I’ll have all nines issues of Team Stryker as well as the published Volume 001, posters, commissions and more! Follow me and Team Stryker on Facebook, Twitter and Instagram at @TSComic for all your Team Stryker needs.